Thai Red Curry – probably one of my favourite things I ate in Thailand! Spicy, rich, creamy and just plain amazing! This recipe for our tantalising thai red curry was learnt when we were on holidays together in Thailand, which in fact was our very first overseas holiday together back when we had been going out for about 6 months! I love making this recipe, because it reminds me of good times that we’ve had, and just how much we have done together in the past 7ish years (aww, now I’m getting nostalgic). 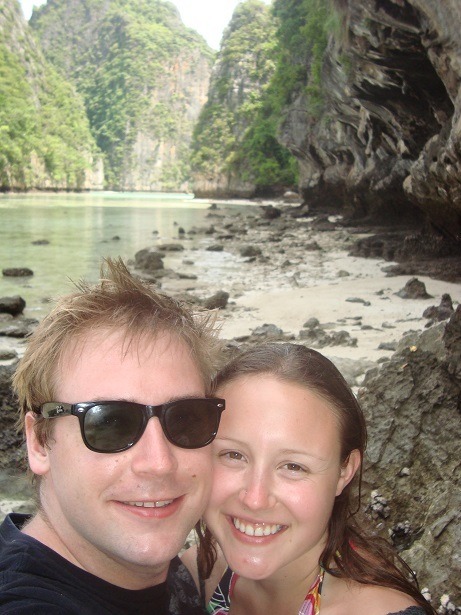 So back in 2009, it was kind of by coincidence that we ended up in Thailand together. My brother and sister in law were getting married in Koh Samui, so my entire family flew over from various parts of the world for that. 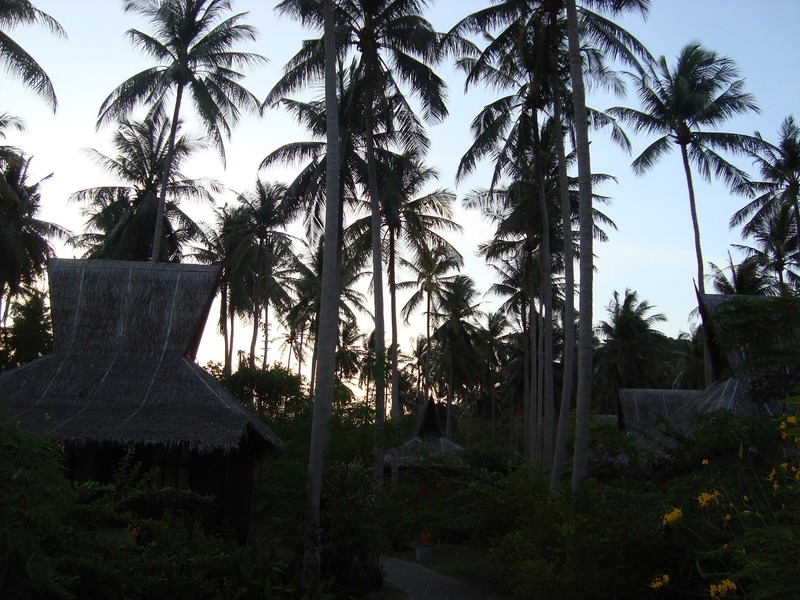 We stayed in Koh Samui for about 10 days. At the same time, Adam and his brother and now sister-in-law decided to take a holiday, starting in Vietnam, then heading into Cambodia and finally finishing in Thailand. So, naturally it made sense for Adam and I to meet somewhere in Thailand. 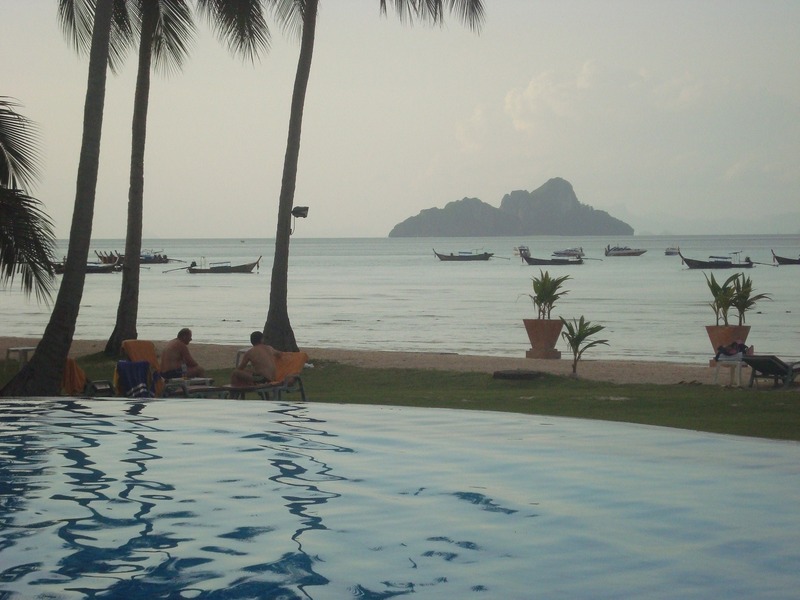 We decided to meet in Phuket and had a couple of days in Phuket, before taking a boat to the beautiful Phi Phi Islands. 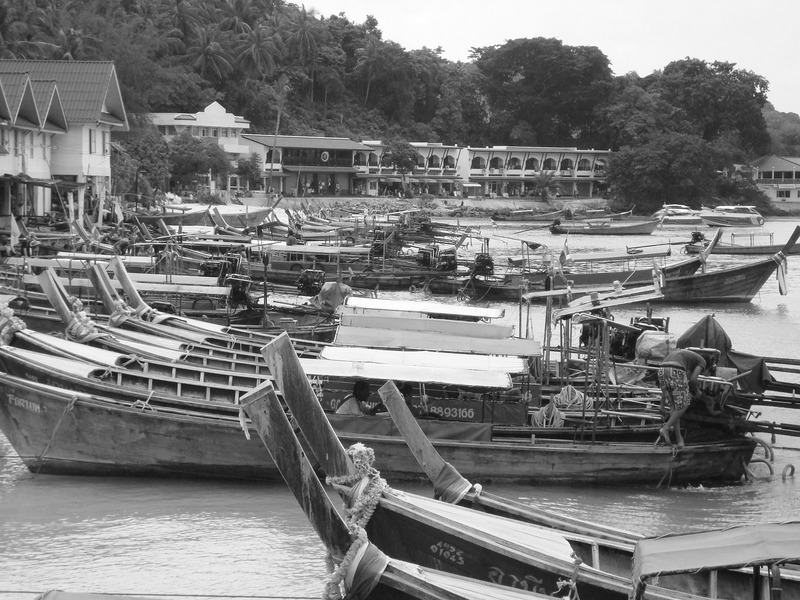 After that, we ended up in Krabi town (not really sure why) then back to Phuket before flying back to Melbourne. Thailand is a really great country, the people are absolutely lovely and the scenery is breathtaking, especially around Phi Phi Islands. 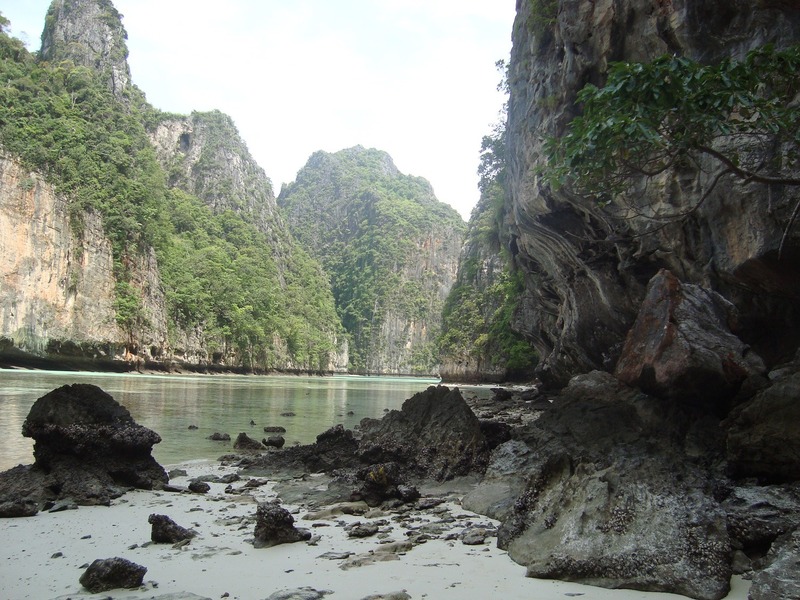 Thailand was always a great option for us travelling from Australia because it was usually relatively cheap and easy to get there. We’d love to go back and check our far northern Thailand, and I’d love to go to Cambodia and Vietnam and show Adam Laos. Aw we look so young! 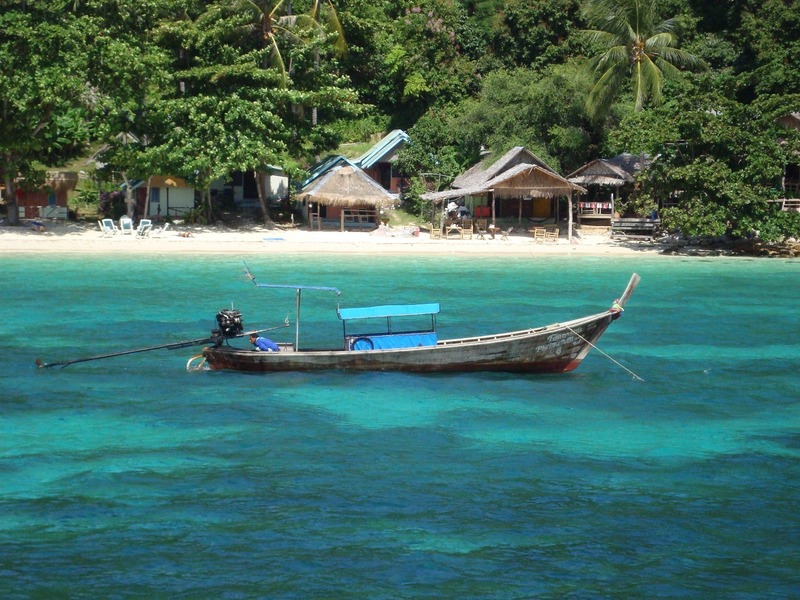 What we loved about Thailand, was probably the food (and cheap drinks and clothes of course!) But the Thai really, really, REALLY know how to cook. We got hooked on so many different foods, but our favourite was probably this thai red curry. Me, being the chilli sook I am, prefered the red over the greeen curry because the green curry was spicier! What makes Thai food amazing is that wicked balance betwen the salty, the spicy, the sweet and the sour. Everything in balance just taste so damn delicious and they really know their flavours. I took a Thai cooking class in Koh Samui with my sister and brother, and this was one of the dishes we learnt how to make. We’ve adapted it since then, Adam prefers to add a little more spice than I do, but we think we’ve got the flavours down pat! 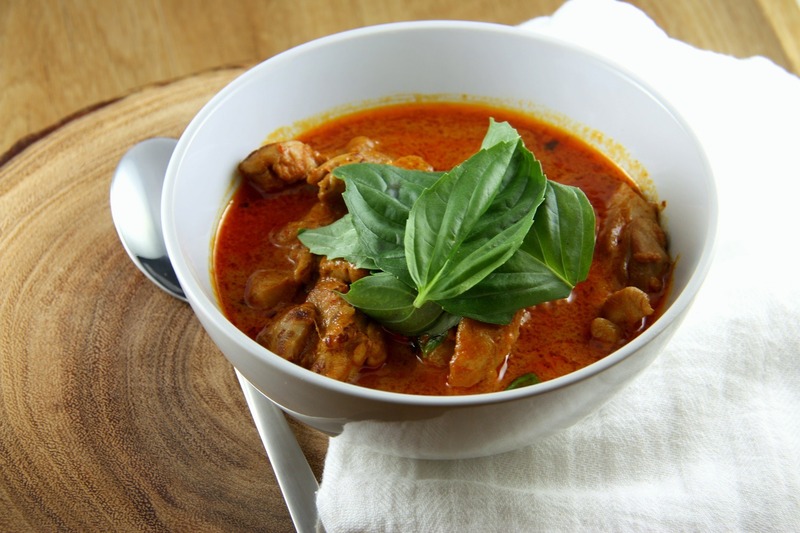 The key to this thai red curry is to keep tasting it and adding to your taste preferences. If it is too salty (you’ve added too much fish sauce) then try adding a little more sugar, lime or chilli. Usually the easier elements to balance are the fish sauce and sugar. You can really make this to your own taste, everyone will be different, but this is how we make it, and we love it! What is even better, is that it is still two servings – no wastage! This recipe is also fairly flexible. If you don’t have certain ingredients or can’t get them, such as kaffir lime leaves or coconut sugar, you can sub them out with something else. Try being as authentic as possible! On that note, we learnt how to make our own curry paste too, but haven’t got around to making it yet so we just use a good quality store bought variety! So enjoy cooking! And if you have any questions, about the food or Thailand/South East Asia in general comment below! This thai red curry packs a punch, combining flavours from all corners of your mouth, the salt, the sweet, the sour and the spice. This curry is guaranteed to knocked your socks off! Keep milk on standby if you over do the chilli! 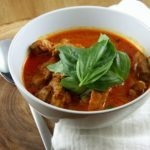 2 tbsp red curry paste, just store bought, or you can make your own! Heat cocunut oil of high heat in a wok or large, deep frying pan if you dont have a wok. Add curry paste, then chicken and stir for 2 minutes until chicken is seared, fragrant and changing colour. Back off heat and add cocunut cream/milk. Stir until combined. Add fish sauce, chilli, pepper and lime and cook for a couple of minutes. Add coconut sugar, and taste to see if you have the balance right. Simmer for long enough to ensure chicken is perfectly cooked and juicy. It should only take another 5-10 minutes if your pan is hot enough. Serve immediately over long grain white rice. When in Thailand we were taught that all Thai food is about getting the sweet (palm or cocunut sugar), the sour (lime), the salty (fish sauce) and the spicy (chilli) elements all in a perfect balance. Make sure you keep tasting you curry as you add the ingredients! What dishes remind you of somewhere special or of a good time? Comment below!